I’ve been drawing more famous people from my local TV guide (print version). I’m doing this to improve my portrait drawing skills. The low quality of the print ensures that I need to add some of my own interpretation. Furthermore, after the two-week break of the portrait class in my local community college, I want to impress people with the progress I can do on my own. 7. I didn’t use an eraser for drawing this portrait of Albert Verlinde, so that I would force myself to look carefully before I draw, as well as learn how to correct mistakes without an eraser. 8. 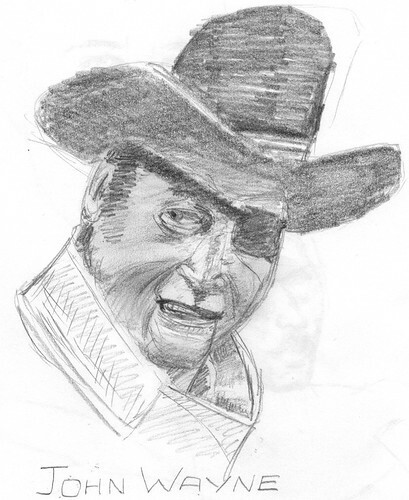 Another drawing done without an eraser, this time of Western movie star John Wayne. 9. 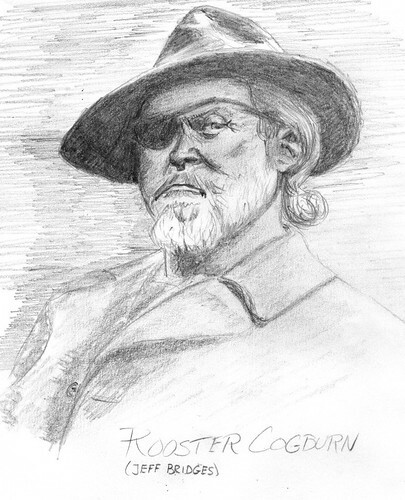 I wanted to try two things here: use a colored pencil for an underdrawing, and use a technique to check if your drawing is correct from Bridgman. The first one failed (I couldn’t get the pencil markings to cover the Pentel lead), but the second one succeeded. All features (mouth, nose, eyes, ears, etc.) should line up with line 4. I could see I had made a mistake, and after checking the 4 lines on the original, I was able to correct the drawing. The pipe is a mess, though. While I drew it, I saw how it was constructed. Sorry. 10. 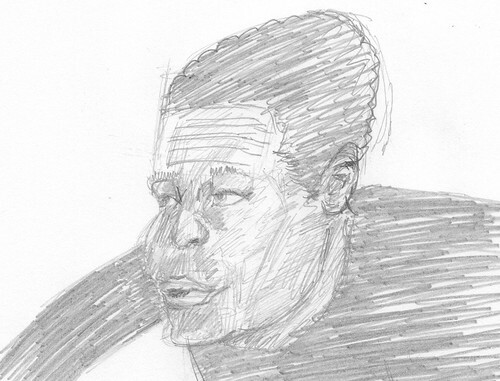 The disadvantage of drawing from low quality photos is that you need to do a lot of interpretation. Even so, the human figure is the human figure and there is some logic to its shape. It is finding this logic which puzzles me. Sometimes I get it, most of the times I don’t. I started the sketch by drawing a block as the forehead, a plane underneath it, representing the cheek area, the cylinder of the teeth, and a horse shaped lower jaw. This might seem basic to some of you experienced artist, but for me it still is a big mystery. 11. This is what can happen if you just start drawing. Well, I did some preparation, but I didn’t do enough. A portrait like this, with my current skill level should take at least 3 hours. I took less than 30 minutes. No wonder it is all wonky. Even in portrait class I often need 30 to 45 minutes to get the basics right, while others do that in less than a minute. I want to be faster, be I guess I have to be patient. For the moment I’m just slow. 12. 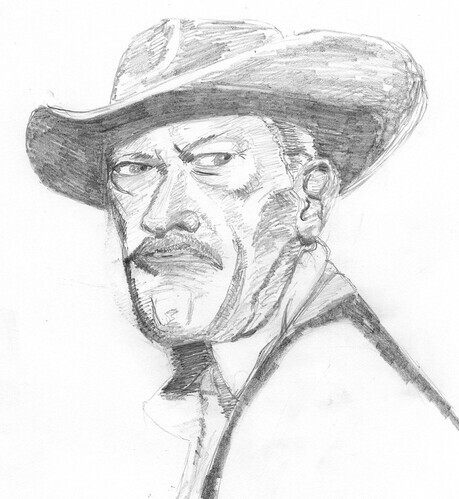 This was a warm-up sketch and drawing from my TV guide, which had a special about Westerns. I think I have never seen this movie, but judging from the description I wouldn’t like it very much, because of the excessive violence. 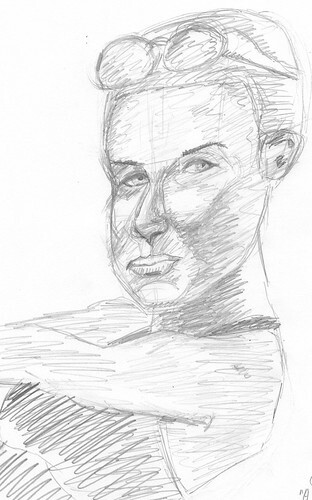 When making the sketch, I first tried to carefully draw the contours, looking for landmarks, angles and basic anatomy. Even so, I got the left of the drawing completely wrong and had to redraw it while the rest of the drawing was already done. This meant the chin is much too big, although it doesn’t seem too noticeable. In fact, it makes it even stronger than the original photo. The 3D perspective is off as well. So while there is a lot of things wrong with this drawing, it still is a strong image, because I did pay so close attention to making it look impressive. 13. 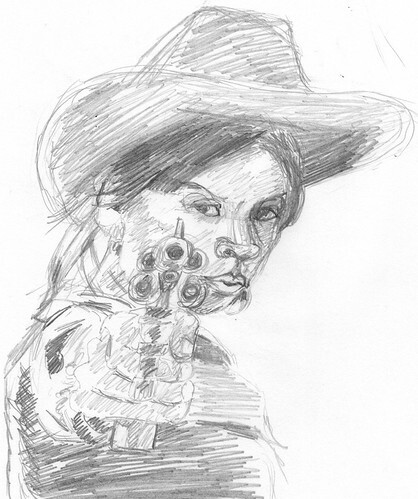 In modern Westerns, women aren’t the passive and cute beings anymore, but bad behaving actors that can sling a gun as well as any male cowboy. I’ve been drawing a few famous people from my local TV guide (print version). I’m doing this to improve my portrait drawing skills. The low quality of the print ensures that I’m not copying the photo, but, instead, that I need to add some of my own interpretation for the larger version. You see, the portrait class at my local community college has a 2-week break and I want to blow my instructor’s socks off with a jump in quality. Well, that’s what I’m telling myself, because what I really want is to improve radically. Trying to do so by pretending I’ll impress the instructor is as good a method as any. 1. 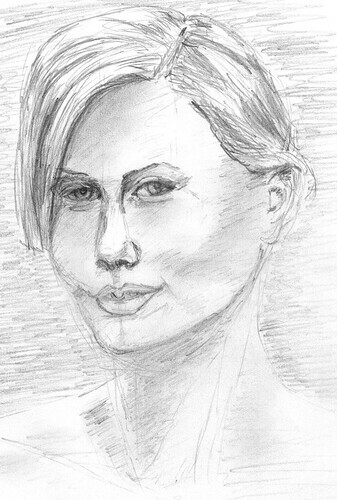 (Feb 20) While this sketch of Charlize Theron seems solid enough in quick passing, there are some things that could be better (as there always are). That is a good thing, because it means I’m still progressing. The way I set up the sketch was different from what I did previously. I find tried to visualize the head as a block in perspective and tried to see it without the hairdo. Next, I set up the proportions of the features (where I made a mistake, by making the nose slightly too long), and corrected the initial outline of the head and neck accordingly. Finally, I added the hairdo and the shading on the face and neck, and made the background darker. 2. (Feb 21) Used another photo from the TV guide, showing a photo of the character Krystle from the TV series “Dynasty”, played by Linda Evans. The photo was tiny, so I had to do a lot of guessing. Notice that her left eye is drawn too high, because I had the angle of her head guessed wrong. Now I come to think of it, if you see so much of the top of the head, the model must be tilting her head forward, with her chin closer to her chest. 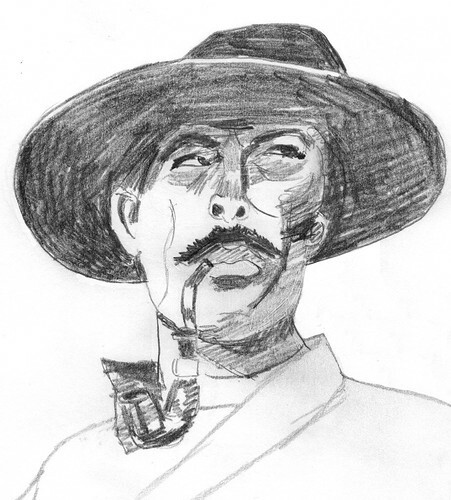 So it all comes down to visualizing what the character is doing before you even put a pencil on paper. 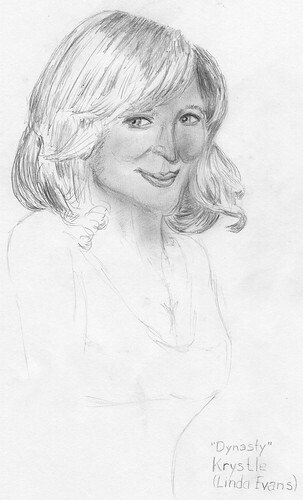 Even so, I used this sketch to practice my rendering, especially of the hair. Because the eye is placed wrong this will not be put in any portfolio. I guess it is an important piece for study, because it teaches me (and hopefully some of you), that you really need to think about your subject, and reason about it internally. So why does she look up to the camera, tilting her head down? Well, it gives a cuter look, or at least a more youthful look. Children are much smaller than adults, and always have to look up to adults to have eye contact. If an adult tilts his or her head forward (even if it is a slight tilt) to another adult, and looks up, it signals: “I’m no threat to you!” Conversely, if an adult tilts tilts his or her head back and looks down upon another adult, he or she signals: “I’m so much more than you.” It would be a threatening pose. 3. 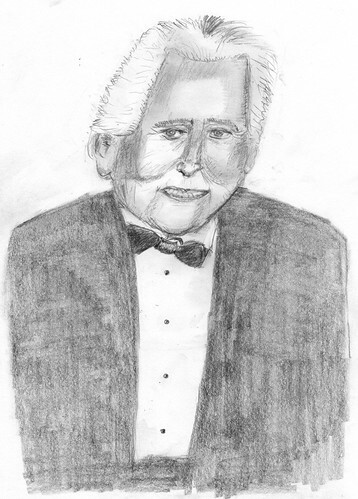 (Feb 22) While drawing the character Blake of the tv series “Dynasty” (played by John Forsythe), I realized that the drawing class at community college is perhaps a bit demanding, and I need at least a day to recover from the experience. I guess it’s the combination of being in a strange place, having peer pressure and a live model that is tiring the part of my brain that does art. Nonetheless, I kept trying to do more sketches that day, to get it out of my system. 4. 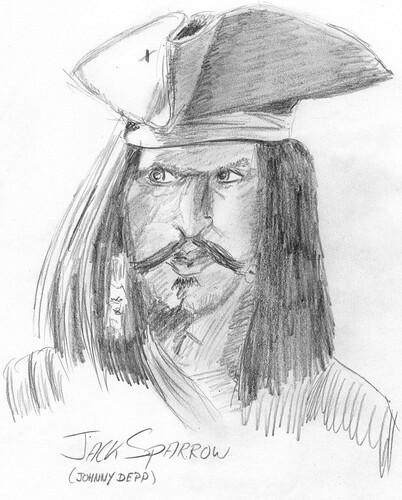 (Feb 22) I love the character of Jack Sparrow (played by Johnny Depp), although I have only seen one of the movies of the Pirates of the Caribbean series. He is quite over the top and instantly lovable. 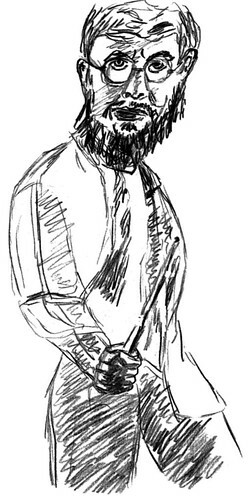 As you can see, there are a lot of things wrong with this sketch, which I was not able to correct (yet). 5. (Feb 23) Although I’m more a John Wayne fan for Westerns, I guess Jeff Bridges does a nice Rooster Cogburn in this remake of the 1969 movie “True Grit”, at least on the posters. The pose in the sketch is based on a photo in my TV guide. 6. 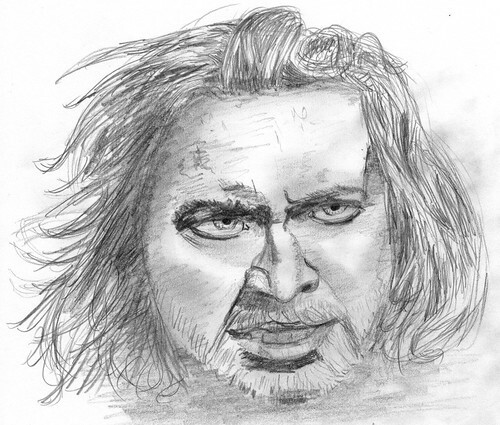 (Feb 24) I used a movie poster in my TV Guide to draw this approximation of Nicolas Cage. I know his likeness is kinda wonky, but it is still a strong portrait. I wished we had people like this in our portrait class at my local community college. That would certainly rock, big time. 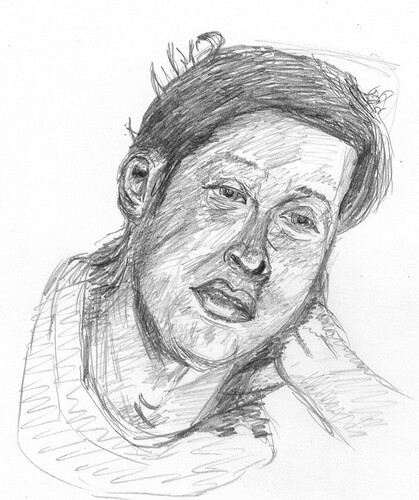 I will continue mining the tv guide and whatever I come across to practice my portrait drawing skills. See you in part 2. 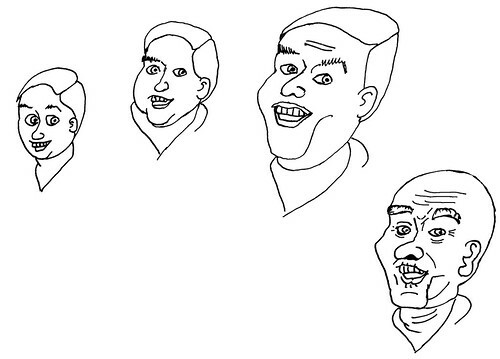 In the book about character design by Tom Bancroft, there is an exercise to draw a picture of someone you know, and change their age. It can also be a famous person. I picked Leo Laporte for that first attempt. The original is the second from the right. Of course, this is just a first attempt, but it a fun exercise, you could try for yourself. It teaches you a lot about drawing characters and how age affects them. Bancroft even has an exercise to use one character to build another, but not as two sibblings, but as two people who are related, e.g. mother and daughter. That must be a fun exercise to do as well. Not mentioned in the book, but very feasible is changing the gender of a person. Before I can do that, I need to learn more about fashion and hairstyles. I have lent the magazine I mentioned in a blog post I wrote earlier today. Now I need to grok the photos inside. The magazine has a piece on generations, and how they dress. How appropriate! 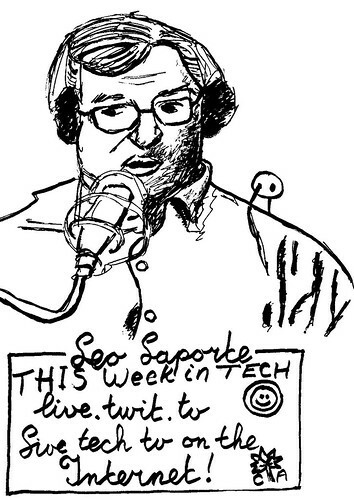 It has been more than a month that I drew Leo Laporte, so I decided to draw Leo from a screenshot I took from the live feed on live.twit.tv. I used color pencil for the underdrawing and inked with both a Micron pen and a reed pen, using Indian ink. I decided to add some lettering as well, and a TWiT critter on Leo’s shoulder. As you can see, I’m lousy at drawing hands. 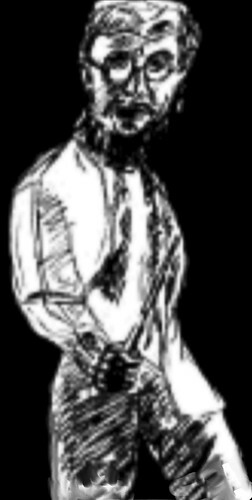 It kinda ruins the drawing. 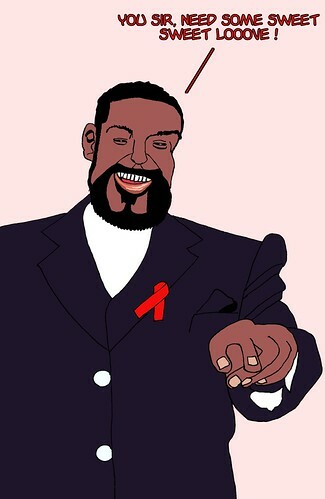 Nonetheless, I tried my very best, and the message is very clear. I was inspired by the title of the most recent episode of Scott Johnson’s Extra Life Radio podcast, which was the same as the title of this blog post. I used a movie poster of Harry Potter as an example, and saw the resemblance with the original was low. I decided to go for comedy effect and add hair to his face, which reminded me in turn of the title of Extra Life Radio. After flattening (separating the background from the foreground) the scanned drawing, I separated the dark colors for the light colors, and put them each on their own layers. The light colors were posterized, blurred, and what else I could throw at it, to give it a dreamy quality. The dark colors of Hairy Potter were sharpened and the contrast between the shades was enlarged, so it got a more realistic quality. The background was made darkish. After converting into grayscale and optimizing the image in Pixelmator, I was left with a drawing that was both dreamy and well defined, which in my view is how Harry Potter is portrayed in the movie, a real boy with magical powers. The reality draws you in, and the magic keeps your attention. Here are the two layers of character side by side, so you can see what I was aiming for. I’m starting to get comfortable with my process, which is important if I want to get better. You don’t want to get bothered by the technical bits of your process, but rather concentrate on the creative parts. Here is another sketch I ran through the process, from blue pencil sketch, inking with rollerball pen, scanning and digital manipulation in GIMP. And if you hadn’t noticed, I’m actually starting to like this drawing thing. 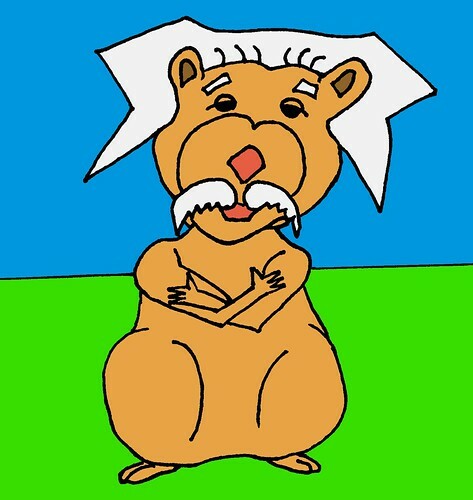 Also, the character gets refined with every drawing I do. However, if you look closely, you might see the anatomy of the arms is kinda wrong.